Holidays in Monopoli take you to the north east coast of Puglia, along Italy’s spectacular coastline. Here you’ll find the perfect opportunities to immerse yourself in the history and culture of the country, with winding cobbled streets and 12th Century buildings leading down to the pretty port. Couples will enjoy the chance to relax and sink into the laid back lifestyle of the area, while families will find lots of exploring to do. When it comes to history, there is plenty in Monopoli. Wander along the historic walls which line the coast, or head up to the Carlo V Castle for spectacular views of the sparkling sea below. Monopoli Cathedral dates back to the 12th Century and is ideal for those wanting to explore some of the ornate designs inside, while Palmieri Palace is home to an impressive façade. The little port is picture perfect, with its little blue boats surrounded by warm stone buildings. Luxury holidays in Monopoli can be spent on golden beaches or in the pretty town itself. Like most towns in Italy, there are fantastic restaurants with famous hospitality around every corner, with chic bars and little boutiques thrown in for the upmarket crowds. Walk or mountain bike in the surrounding farmlands where you can explore restored farmhouses and olive groves or visit vineyards for idyllic views and local wine tastings. Choose Sovereign for your luxury holidays in Monopoli and we’ll ensure you find the perfect hotel for your time away. Each of the properties we offer has been carefully selected and offers fantastic facilities and unique touches of comfort. 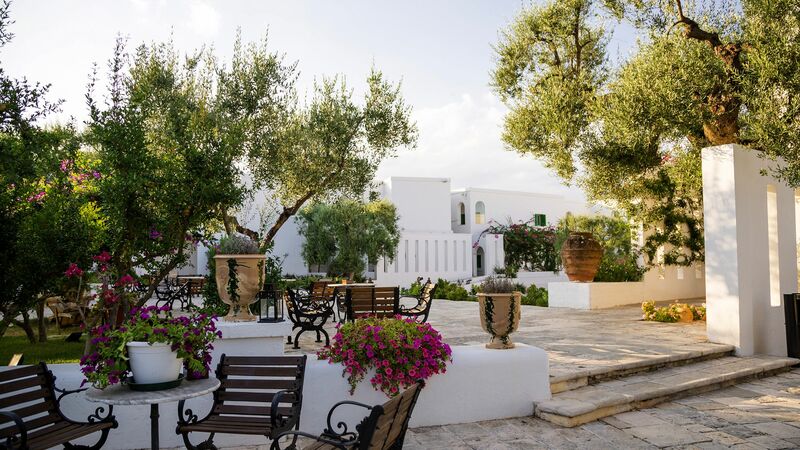 Stay at the Il Melograno for elegant décor within a traditional whitewashed building. Dine on exquisite Mediterranean dishes by candlelight on the al fresco terrace or make the most of the spa at the Wellness Centre. Flights to Puglia take around 3 hours from the UK. Transfer time from Bari airport to Monopoli is approximately 50 minutes. Nestled right in the far south of Italy, Puglia has a balmy Mediterranean climate, with warm springs and autumns that see temperatures in the 20s well into October. Head here in the summer and you can expect plenty of beach-perfect days – blue skies, sunshine and temperatures nudging 30°C.